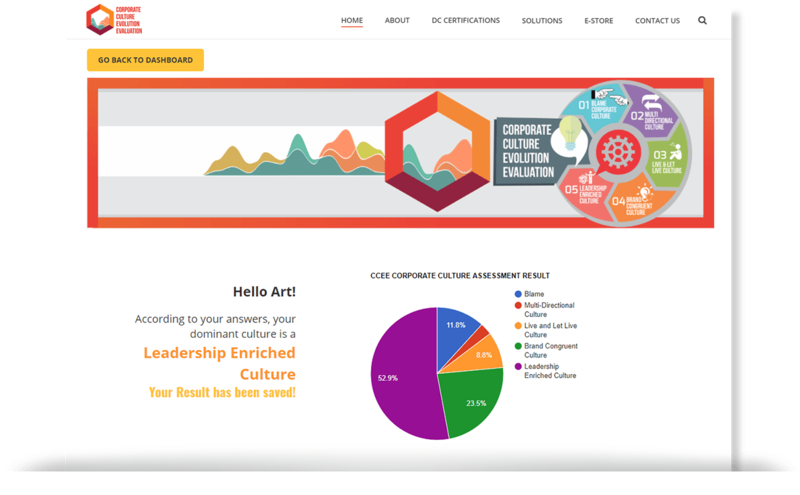 The Corporate Culture Evolution Evaluation (CCEE) is an Organizational Culture assessment that identifies the specific “Culture Evolution Levels” your organization is at. This is important as a benchmark Evolve the current culture to higher levels of efficiency, engagement and proactive action towards organizational objectives. The assessment identifies the culture that is dominating your organization and also gives you insights to areas that you are more evolved in. This supports defining organizational culture directions and measuring what is working and what is not. Organizations use this culture assessment to measure their organizational culture change initiatives or simply improvements in culture to determine training ROI. 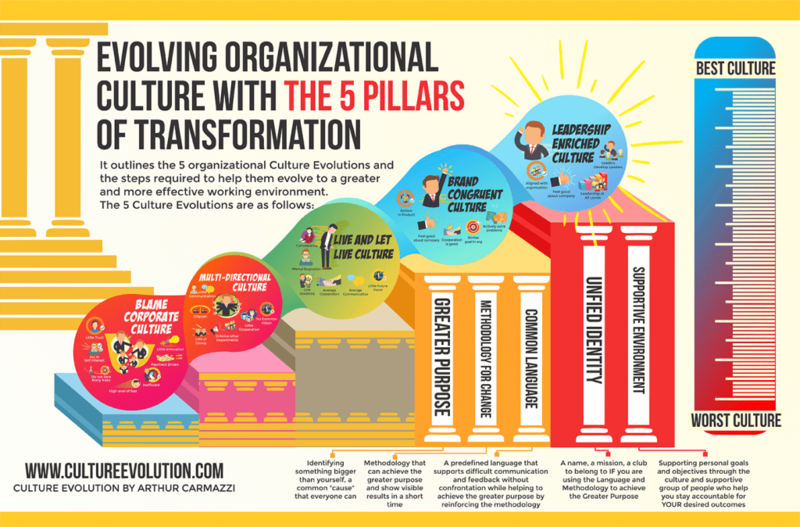 This evaluation is designed by Global Top 10 Thought Leadership in Organizational Culture Arthur Carmazzi, to assist contribute to the improvement of your organizational culture and make your company a better place to work. All your evaluation are kept confidential and the more honest you are in answering the questions, the better the effect of making the necessary change to improve the organizational culture and fulfillment in the organization. A DCI study on organizational culture including 70 companies/divisions of similar sizes with 600 to 800 people across industries was conducted to identify the effectiveness of manpower based on 17 parameters that determine good or bad culture. 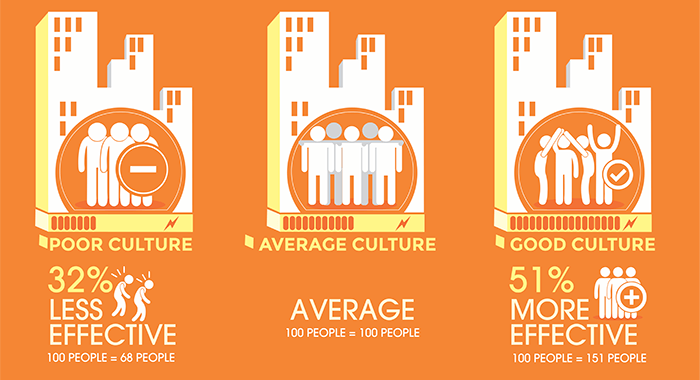 According to Arthur Carmazzi’s Research, there are 5 levels of corporate culture, and each statistically has proven different levels of efficiency based on comparable skill benchmarks across 8 different industries. The lowest corporate culture: “The Blame Culture” harnesses the lowest productivity from its people. 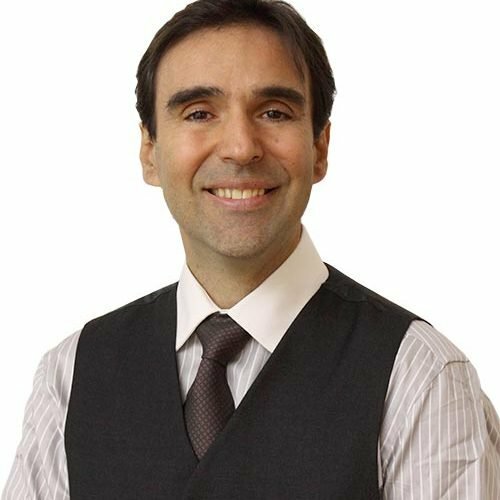 A DCI Research initiative led by Arthur Carmazzi identified an average Organizational Culture where 100 people are doing the work of 100 people. While in a poor organizational culture 100 people were doing the work of only 68. While, at the highest level of corporate culture evolution, the Leadership Enriched Culture, 100 people are doing the work of 159. That’s like having an extra 59 free employees more than the Average, non-dysfunctional corporate culture. Would that make you more competitive? Corporate Culture Evolution requires the functional base of Directive Communication psychology at the mental, emotional and physical levels of an organization to create a common method of communication, understanding and approaching tasks and decisions. Arthur Carmazzi’s Organizational Clture Change program facilitates visible results through the knowledge and skills required to apply DC Culture Evolution strategies in the change management and culture change process.